Today Anahuac was issued on Audible.com as an audio book. The novel is now on Amazon, ITunes and Audible. There is a free preview of a portion of the audio book available on Amazon.com. The audio version of Anahuac was performed by Alan Adelberg, a professional narrator with national credits. Joel Block of The Block House Studio who is an award winner produced the recording. I was truly blessed to find such talented professionals. 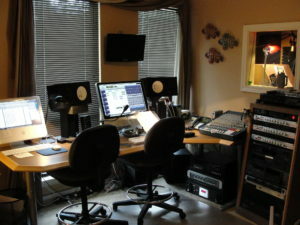 I described a bit of the recording process in prior blogs. There is great joy in hearing the words come alive and all you have to do is close your eyes and listen. Authors hear character voices when they write. I was pleased to hear some different inflections in Alan’s performance than what I heard when I wrote the words. His ideas actually enhanced the story. If you have friends who like audio books please tell them about Anahuac. I would encourage you to take the time to listen to the preview that is available. Even if you don’t think you would like an audio book (I was one of those before this) you might be surprised. Book clubs are a writer’s best friend. 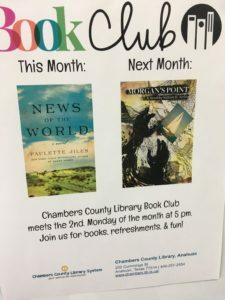 The book club that meets at the Chambers County Library (in Anahuac, Texas) honored me by selecting my first novel, Morgan’s Point, as their novel for the month of March. Last night, the club met to discuss my book. What made the evening even more special for me was their surprise invitation for me to join them via Skype. I wasn’t sure what to expect, but I enthusiastically accepted. What a grand evening it was for me and (I hope) for the members of the club. I would love for other book clubs to read my books and extend me that same invitation. If authors have to explain too much about their book, they probably missed the mark. The Anahuac folks were full of questions, but they were the kinds of questions that I would have asked of authors whose books I enjoyed. I don’t want to provide any spoilers for those who might want to read Morgan’s Point or Anahuac, but women who meet the world on their own terms, predestination, mangled justice and the origins of the name Faircloth were hot topics. During our discussions I discovered that Faircloth, the last name of major characters Taylor and Cooper Faircloth, is also the last name of the State Representative for the area. I had to explain that there were specific reasons I used the name Faircloth, but not because of the Honorable Mr. Faircloth. Another fact that I learned during the meeting was that the old Mexican Fort that once stood on a high bluff along Trinity Bay in Anahuac had tunnels that were used to bring cargo up from ships. I wish I’d known that when I wrote Anahuac. There would have been some underground fun. Maybe it’s not too late. I am busy writing two books now. One is a prequel about Sarita Jo Franklin, the toughest woman on Smith’s Point, Texas, who was an important (albeit briefly appearing) character in Anahuac. The first time I ever heard of a book club came back to me as I waited for the Skype call last night. I was only eight or nine years old when I first saw the movie The Third Man at the Woodlawn Theater in San Antonio. Joseph Cotton played the role of Holly Martins, who wrote schlocky Westerns. Martins is in post- war Vienna because of the death of a good friend, Harry Lime, played by Orson Welles. As a young boy, I was lost for most of this film noire masterpiece because of the film’s complexity. One uncomfortable scene I did understand was at a Vienna book club meeting to which Martins is invited to speak. It seemed that Martins has a following of intellectuals in Vienna who were dying to pick his brain about his cowboy works. Martins is out of his depth and their deep questions about his shallow works leads to an embarrassing evening. That memory was probably not the most settling of remembrances to have immediately before an appearance before a book club. Fortunately, I think I escaped Holly Martins’ fate last night. Last night was enjoyable and instructive for me, and I’d like to thank the members of the Anahuac book club for such a wonderful evening. 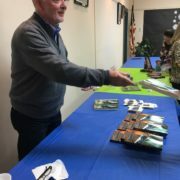 If you are a member of a book club and want to read one of my books, I will myself available for your meeting to discuss the book. Skype is an easy, fun way to make this happen. I feel strongly about an author’s responsibility to support library organizations. The Chambers County Library System is doing a great job in supporting their citizens with a modern library and a knowledgeable staff. Sue Hawthorne worked tirelessly to organize the book event. It was great to get back to Fort Anahuac State Park and fantasize about days of yore when the Mexican Army Fort ruled Trinity Bay and William B. Travis practiced law in Anahuac. Texas revolutionary history had its beginnings at this site on 1832. The trip to Anahuac is not easy, but I recommend it. The annual Gator festival is a spring event that brings in large crowds. I hope to be there this spring. 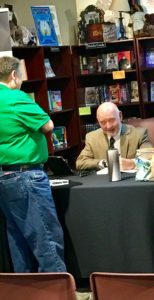 I did a book signing at the delightful Deep Vellum Bookstore in Dallas this week. That was an actual trip. 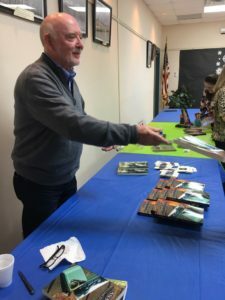 While I was doing that, I was also traveling all over the state on the virtual #LoneStarLit tour. 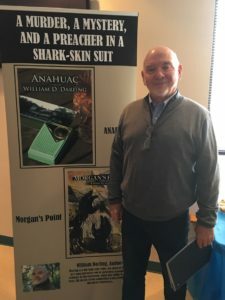 Ten professional bloggers covered my book in all: Some interviewed me, some printed excerpts from Anahuac and four provided professional reviews of my book. 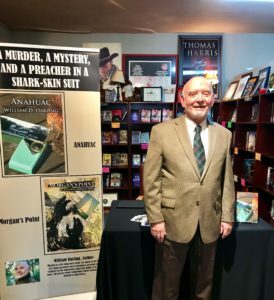 You can see those reviews in their entirety at Missus Gonzo‘s and the Forgotten Winds blogs, as well as Kristine Hall‘s and Ruthie Jones’ websites. I am appreciative of the in-depth, honest and very positive reviews these critics gave the book. It is an amazing feeling to read a review of your work in such depth. I can truthfully say these reviewers got what I was trying to say. I didn’t start out to write a book that was heavily influenced by the plight of women in the work force in the early 1970s. The more I wrote, the more they edged their way into the book. I suppose that its about time someone highlighted the barriers that women faced in the work force in the 1970s. Those of you who have read the book know this is not a book about sexual harassment. While that harassment was present in spades in those times, this book examines the difficulties women faced in just getting a chance to compete. Those difficulties are told in the individual stories of Sarita Jo, Cooper, Aurora and Chinky. The first step in gaining a semblance of equality was overcoming the idea that women didn’t have a real place in management and the professions. While the four strong women in Anahuac are a major part of the story, I don’t want the men in the book to get short changed. Jim, Reverend Clay, Maurice Marrow, Wells Wilson, Little Harry and Sheriff Staunton all have their part in telling the story that has no easy answers. The blog tour was a blast. Next weekend the Chambers County Library System will hold an Author’s Event in Anahuac at the library on Saturday January 20th from 10-12. After the forecast of early week cold and snow, a weekend trip to see the world of Anahuac might be fun. Hope to see you there. 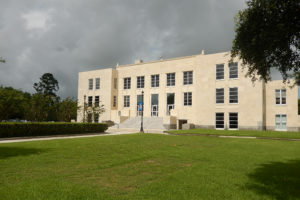 Chambers County Courthouse where the fictional murder trial is conducted. Thriller is definitely an apt description for Anahuac. 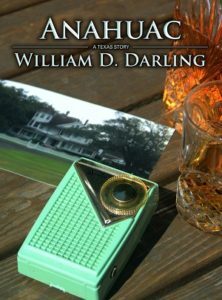 The entire story is a fast train ride through the Texas legal system in the 1970s. What could be more thrilling than that? Jim Ward is not a new character. You will find him among the pages of Book One in the A Texas Story series: Morgan’s Point. In Anahuac (pronounced Anna-whack), Jim finds himself on the defense team for a charismatic spiritual leader from Arkansas charged with the murder of someone who apparently willed an entire estate to his radio ministry. All the characters are incredibly dynamic and memorable, with nary an underdeveloped one in the bunch. Even the minor characters jump off the page! Word of caution: the story does take place almost 50 years ago, so be prepared for a hefty dose of misogyny and some racism. Strong, successful women are treated as oddities, and a professional woman in a pantsuit is considered a disgrace; however, Anahuac has three such strong women who set the story on fire with their audacity to succeed in a “man’s world.” Welcome to Texas in the 1970s. I will say that Anahuac is unfortunately timely and timeless in its portrayal of the treatment of women in the workforce. The story is told through Jim Ward who struggles to find his voice and purpose apart from his wife’s family’s wealth and prestige. Becoming a trial lawyer on such a high-profile case could be just what Jim needs to put his name on the map, instead of simply being referred to as Taylor Faircloth’s son-in-law. The actual crime takes a backseat to the the events leading up to the trial and the trial itself of the Reverend Randall Clay for alleged murder. Clay is a piece of work and a thoroughly interesting character; I found myself vacillating between liking him and finding him completely frustrating. I can’t seem to make up my mind about this guy, which is a testament to William Darling’s ability to write a character that makes you laugh one minute and grit your teeth the next. And then there is Maurice Marrow, Clay’s manager. I did say the characters are dynamic! Don’t worry readers, I won’t leave you hanging. The next book in the series is in the works! I will be in Dallas next Friday evening January 12th from 7-9 for a reading and book signing at Deep Vellum Book Store. Deep Vellum is an iconic book store in the Deep Ellum area of Dallas at 3000 Commerce Street. Here is an interesting history of the building I found on the Deep Vellum website. We’re located in the historic heart of Deep Ellum, our roots grounded in growth, tenacity, and expression. Gen X may remember our home as Club Clearview, the sign still perched in our store windows, or as the site of the inaugural Dallas Film Festival. Boomers may remember this building as a reputable storefront, or as home legendary blues and jazz artist Leadbelly, his music drifting through the alleyway at sunset. As for the Millennials – this was the site of an unregistered winery, our floors now pocked with meritage blends. To us, it’s the site where it all begins. Where ideas are considered and discussed. Where the best & brightest mingle with the up & coming. Where Dallas unites in the vision to create a stronger, more vibrant culture. I hope to see you at Deep Vellum. I am reticent to tell you how little I know about audio books since many of you routinely “read” books in that manner. Everything I know I have learned in the past two weeks. Those of you who know me understand that holding a book in my hand is such a joy that I hadn’t explored the alternative. After listening to a few snippets from audio books I see the attraction. As I told you in my last post we are working with Joel Block at his studio in Austin. 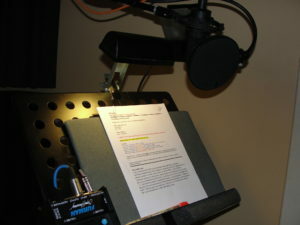 I encourage you to click on the link to the studio if you have interest in seeing how audio books are produced. Joel and his wife are extremely knowledgeable and have been a delight. I will be giving you regular updates of how Anahuac is becoming an audio book. 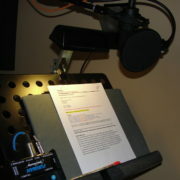 The latest is that Joel has received several audition tapes from the talented people who do narrations. By Monday we will have tapes from everyone who is interested in being considered. The willingness of these talented narrators to vie for the job of bringing Anahuac to life is humbling. Let me know if you have any questions about audio books.